No Matter What Kind Of Event, We Will Make It Memorable. Our entire business is built around events. Big, small, special, and memorable events. Our team of Wedding & Event Experts knows how to take any event that requires DJ, MC, Photo Booth, or Lighting to the next level. 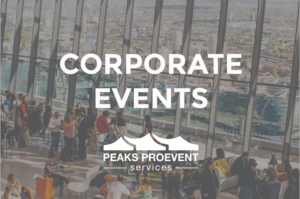 With a trained and excited team of pros, Peaks ProEvent Services can’t wait to hear how we can help you make whatever you are planning a success. If you looked through the list of events above, and just don’t see anything that matches the event you are planning, no problem. We offer 100% Customizable services to occassions of all types and sizes. Please reach out to us for a free consultation, so we can discuss your event and get you exactly what you need. Nearly every event we have the honor of assisting is a special occasion. Whether it is a wedding, a Prom, a Corporate Team Builder, or a Fund Raiser you can trust that we understand the integral part we play in it’s success. We are DJs, we are Masters of Ceremony & Celebration, and we know how to guaranty the special stays in every occasion. We specialize in weddings. When it comes to celebrating a wedding, one thing that many couples and entertainers overlook is the importance of preplanning. We provide 100% customizable entertainment to make sure your wedding matches you as a couple. We also offer multiple tools to help you and your DJ or Photo Booth Operator plan the entertainment for your event. By meeting with you numerous times, we guaranty that the day of your wedding will be more memorable and less stressful. We are proud to be the largest team of DJ’s and Entertainers serving weddings in Northern Arizona. Our main office is right near the San Francisco Peaks in Flagstaff Arizona. Peaks Pro has a team of Wedding DJ’s who are experienced and ready to make your Arizona Destination Wedding a breeze. We work tirelessly to make sure we provide the Premier Wedding DJ & Entertainment service in our area. Reach out to us right now to start planning the perfect wedding day! No one can lend more to the success of your corporate or company event than a DJ. Why is that? Because a DJ has ultimate ability to adapt. We have rocked full sized dance parties, played walk up music for awards ceremonies, and even helped run trainings as the MC. One of the most common company events we service is Holiday Parties. Our DJ’s love to provide the perfect holiday soundtrack while your guests eat and mingle, and then end the night as an all out dance party. Contact Us right now for your free consultation, and let’s start planning your next event. Are planning Homecoming, Prom, Sadie Hawkins, a BonFire, an Assembly, or even your Graduation? The Peaks Pro team knows how to help. Our DJ’s are on top of music trends, and members of the School Dance Network which helps us understand what is not just popular, but also appropriate for your next School Event. We are happy not only to work with Elementary, Middle, and High School students, but also with College Campus Events as well. If you are planning a Greek Life or College Campus Event and need a team of DJs with the musical knowledge, gear, and insurance coverage to make it a glowing success, look no further than Peaks ProEvent Services. Contact Us right now to start planning your next School Event. Some people are event planners already, or just really skilled at organizing. Some people know exactly what they need. Other people might need a little more help. We are in the business of events. It is what we do! Do not hesitate to reach out right now so we can explain our services, get to know you and your event, and build a package with everything you need. If you are planning an event you will fall into one of these two categories. I’m still figuring out how this works and need some help. It doesn’t matter which category you fall into. We can’t wait to help you either way, but we also want to cut the hassle and make things easy for you. Read about the category you fall into below, and it will help you take the right next steps. Awesome! If you know exactly what you need, we just need to gather as much information about your event as we can. The best way to do this is through our enquiry forms. There will be an enquiry form setup just for your type of event. The more information you can provide, the quicker we can get you an estimate. No Problem! We can’t wait to answer your questions, and make relevant suggestions that will help take any Wedding or Event to the next level. In this case the easiest thing for you to do is contact us through our main form and request your free consultation. We will always setup a call or chat with you to give you a free consultation about our services, and how they can help your specific event.